Home » Chicken Recipes » Restaurant Style Chicken Nuggets – these were so good, we were asked to remove the name of where these were from. Restaurant Style Chicken Nuggets – these were so good, we were asked to remove the name of where these were from. When you give these a try, I think you will find they taste a lot like Chick Fil A, but that is only my personal opinion. These were so good, we were asked to remove the name of where these were from. Place cool water in a bowl add 1/4 teaspoon McCormick Seasonal, and dissolve bouillon cubes in mixture. Place cubed chicken in water, mix, cover, and place in refrigerator for 12 hours or next day. When ready to cook nuggets mix flour, cracker meal 2 teaspoons seasonal and paprika in a bowl. Heat oil for deep frying. Drain chicken. 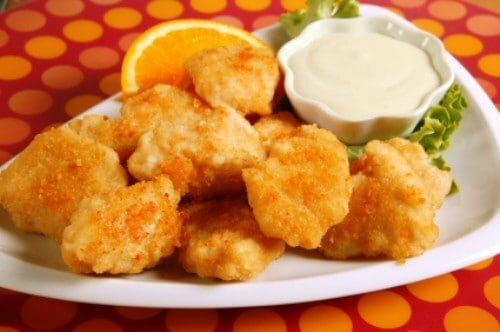 Coat nuggets in flour, cracker mixture and fry until golden. The chicken will be flavorful and juicy. I do know that the chicken is marinated in milk in the refrigerator and chilled before it is pulled out to cook. That makes the chicken moist. while i haven’t yet made this recipe just looking at the ingredient list I can’t imagine these tasting anything like Chick fil A nuggets. In comparison to other copycat recipes and the ingredient list of the actual nuggets this recipe is not even close. Thank you for reviewing the list of ingredients. I haven’t tried the other recipes (the ones with pickle juice & powdered sugar) but have easily made this one a dozen times. I just put the chicken in the marinade for tonight’s dinner. It is spot on! I have been eating Chick-Fil-A nuggets for well over 20 years & was amazed at the accuracy of the flavor. We used to make these because the closest Chick-Fil-A was 45 minutes away. Now we have one in town & I still make this recipe. You really should give it a try prior to commenting on the recipe. Thank you for giving this a try. Thank you for the note on the recipe, I’ll look to update the recipe for the corrected seasonings very soon. This was a much older recipe that was developed. I am honored you said it was the best one you have tried. Taste Like Chick Fil A only without the unnecessary chemicals. Great job. Thanks. That’s the name we were asked to remove. It is a type of seasoned salt. I would interpret Cracker Meal as crushed crackers. Probably something like club or ritz crackers. Maybe try different types or flavors for a twist. I think McCormick Seasonal needs to be changed to Season All or Seasoned Salt to help clarify what the heck it is. Hope this helps other people. I hope I understood correctly also. My husband loves chicken nuggets, so I’m definitely looking for new ways to cook them. Thank you, Stephanie for your wonderful site. I’m living in Germany and its not easy to come by some products or my favorite restaurant dishes from back in the US. Its been a fun time trying to substitute and make things I miss from scratch. Your website has really helped. It is crushed up crackers. I use saltines for cracker crumbs. It is crushed up saltine crackers. I made this for my kids and they loved it. You are right they are very close to their favorite restaurant! We really enjoyed these thanks for posting this one!